Well it’s officially here. The time that hundreds and thousands of people look forward to which brings together family and friends for an annual tradition. South Dakota pheasant opener has arrived! This time of year brings in so many people that the airport actually increases their flights per day to accommodate them. The Aberdeen Conventions Bureau continues on with the annual tradition by serving pheasant sandwiches for the arriving hunters coming off of the airplanes. The local pheasants forever chapter had a their annual pre-pheasant opener banquet last night which provides many people with activities and chances to win some excellent prizes. While many people use this time of year to hunt pheasants with their friends and families, farmers are busy out in the fields. The soybeans are all harvested and now its time for the corn to get harvested. 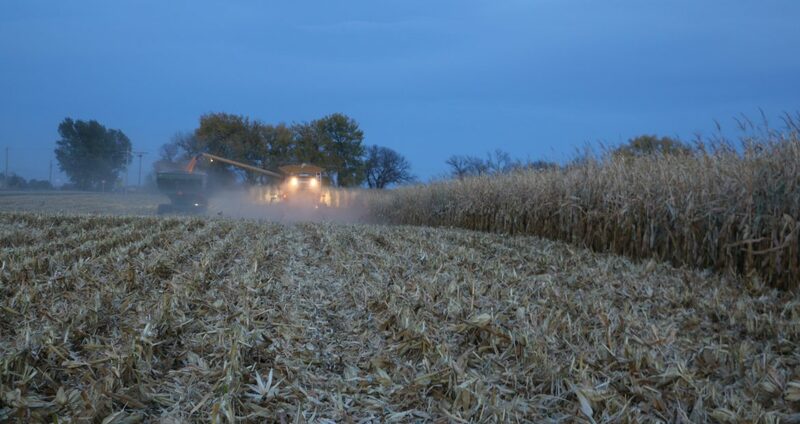 There is still a lot of corn standing but with the weather staying good, farmers can keep busy combining. The time of day may stop the hunters, but it definitely does not affect the farmers. With the corn coming off the fields, it brings money in for them along with better opportunities to see wildlife for the hunters. So I took Owen (future pheasant hunter) out and we checked out some of the fields. We took a look at some of the corn strips, checked out how the farmers were doing, and then Owen decided to hop in the tractor. While were we checking the corn out, he decided that he wanted to be in some of the pictures. He is quite the model! He concluded that the strips should be pretty good for pheasant hunting and also that the farmers are doing a good job. I would have to say that I agree with him. He got to see some pheasants flying around in the fields and also saw a couple of deer heading into the trees. He helped with a little farming and got to be a part of the stages behind pheasant hunting. Thanks for the company! As were pulled away, he looked back to watch them a bit. © 2019 Royal Flush Hunting Lodge All Rights Reserved.